Repaint. Light-colored cabinets will help your small kitchen appear larger. Placing mirrors above or in between cabinets and counters will not only help visibility whilst chopping those onions, but also give the room a more spacious feel. Lighten it up.If you're not one of the lucky few whose kitchen walls are made up of windows, make sure you keep your kitchen well lit. Installing a cool overhang light fixture on the ceiling or wall will enhance your kitchens décor and ambiance making it more inviting, and conducive to cooking. Install frameless cabinets. Chances are your cabinets have a trim that fits around the cabinet's frame and door. Not only does this take away from the functionality of your cabinetry, it also makes walls seem more crammed and cluttered. Optimize existing cabinetry. Make sure you are making the most of your existing cabinetry. There are many inserts, as well as pull-outs available to help organize drawers and cabinets whether the space is under the sink or over the countertop or in a hanging cabinet. 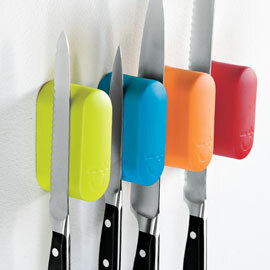 You can also think about mounting cooking knives on your wall using something like these colorful magnetic knife pods available at www.solutions.com - this not only conserves space, but also can give your kitchen a more homey and clutter-free feel.